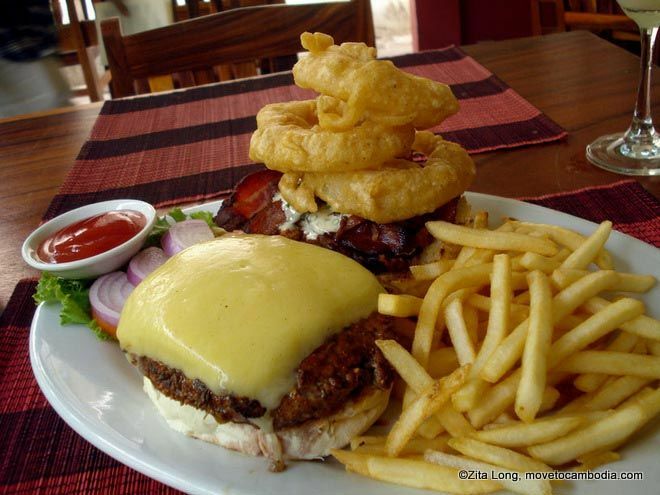 Today’s question: Where is the best burger in Phnom Penh? In my previous post on the best pizza Phnom Penh, I demonstrated why such questions are ridiculous. Different styles, different ingredients, and personal preferences makes the word “best” subjective. 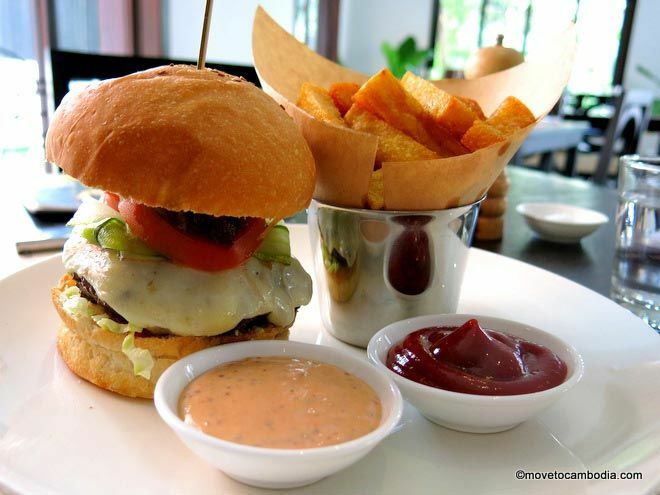 In this post, you’ll see my reviews of four burgers by some of the top burger joints in Phnom Penh (according to online research and food fanatic friends). The 225 gram sous-vide Deco burger. Unlike most food critics, I won’t bother rating each burger on a scale of 1 to 10, a thumbs up, or even a “highly recommended.” Let’s chill, take it easy, and I’ll describe my dining experience as is. However, for the sake of improving your dining experience, I may throw in a few fast facts and suggestions. As the head baker of Siem Reap Bäckerei, a microbakery specializing in artisanal sourdough breads, my senses naturally steers itself towards food that’s made with thought, heart, and soul. You know, food that has finesse, character, a personality, a unique profile on its own. So anything resembling fast food burgers (processed cheddar cheese, mass produced patties, etc.) I’ve eliminated from my reviews. That’s not to say I dislike fast food burgers. Sometimes when you’re lazy or hungover, you think to yourself, “I feel like crap. I deserve to eat crap and, gosh darnit, I’ll enjoy it!” Let’s get to it, shall we? Oh man, what was I thinking? An Aussie burger at an American restaurant? Wait, what’s an Aussie burger, you ask? Well, you might think it has something to do with kangaroos or crocodiles, and it could, my understanding is that it’s a burger that contains the following ingredients: fried eggs, (grilled) pineapple rings, and pickled beets (beetroot), and possibly a few other things. Of course, this is debatable, but most Aussies agree that pickled beets are essential. The Aussie Royale at Brooklyn Pizza: beetroot is not optional. Back to Brooklyn Pizza + Bistro: I had the Aussie Royale, an Australian beef burger, bacon, grilled onions, pineapple, fried egg, pickled beets, and Sriracha mayo. You know when you have a long, intense craving for something — a dry spell, if you will — and then you finally have it and it feels like heaven or bliss? Yeah, that’s what I felt while chowing down on the Aussie Royale. Nearly seven years ago since I last visited the land down under and had a decent burger with beetroot. Now here’s a gesture that I rarely encounter: the lettuce, pickles, and tomatoes were separated from the rest of the burger. Neat! Further, two other features caught my eye at a glimpse: there were no “chips” (for the Americans, fries). Instead, they were replaced with hand-cut “chips” (for the British, crisps). The other eye-catcher was their house-made burger buns. The sesame seeds were sparse and evenly distributed on the surface area of the bun. As a bread baker, I know this takes time and a few extra steps, purely for visual aesthetics. So I applaud you, Brooklyn, for putting that extra effort. Other available burgers at Brooklyn include the Royale Double Bacon Cheese, Mushroom Cheese, and Jalapeno Blue. Who eats burgers at high-end restaurants at ten in the morning? Me, that’s who. I’ve got places to go and business to do. Luckily, you can do just that at The Exchange. Around noon, flocks of businessmen enter the restaurant, wearing leather shoes, sleek trousers, ties pinned to the collars of their buttoned-up dress shirts. What was I wearing? An oversized t-shirt, worn-out jeans, and floppy sandals. Gotta tell ya’, I liked the dirty looks I got from a few them. The Exchange burger: for suits and schlubs alike. On their menu, they have a small “sandwich” section, featuring one, single burger: the flame-grilled Black Angus Beef Burger. For those of you who don’t know, Black Angus is a common breed of cattle raised in several parts of the world, known for its finely marbled meat. This means that the fat is dispersed more evenly, which creates a more tender, juicy, and flavorful cut of meat. However, not all Angus beef is created equal. 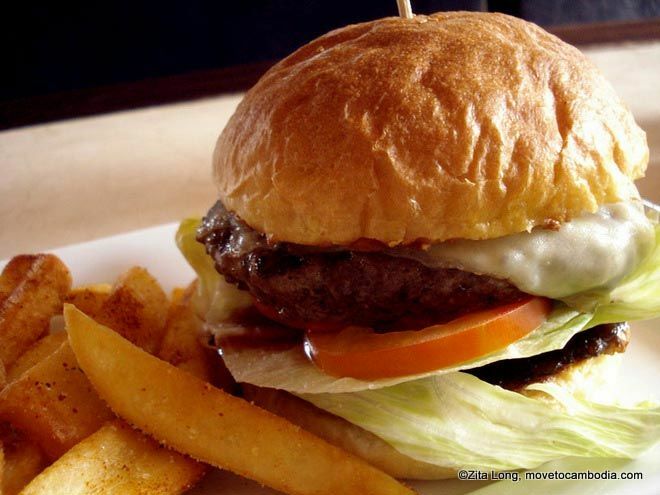 Besides the beef, the Black Angus Beef Burger contained onion confit (onions cooked at a lower temp than deep frying, in fats or sugar syrup), Swiss cheese, tomatoes, and lettuce. The burger also included chips—crispy exterior, soft interior, and well seasoned. Strange as it sounds, I really enjoyed the ketchup and mayo, served on a separate condiment plate. You know those cheap, Asian brands, where the ketchup is super sweet and the mayo funky? That’s not offered at The Exchange, thank goodness. The Exchange is a members-only club, but the downstairs restaurant is open to all. The servers here will ask how you want your burger cooked (medium, rare, etc). You may think that’s no big deal, but for a few reasons many restaurants in Cambodia don’t offer such choice. One reason; they’re tired of cringing or curling into a fetal position when a customer orders “well done.” Caution: there’s no air con at The Exchange, just opened windows, fresh breezes, and pedestal (stand) fans. During hot days, expect to get a lil’ sweaty, especially if you’re wearing a suit. In terms of elegance, Deco (also refers to an art style from the 1920s to early 1940s) is my favourite restaurant that serves burgers, amongst other things. I love the posters, I love the menu design, I love the liquor display, I love the furnishings. 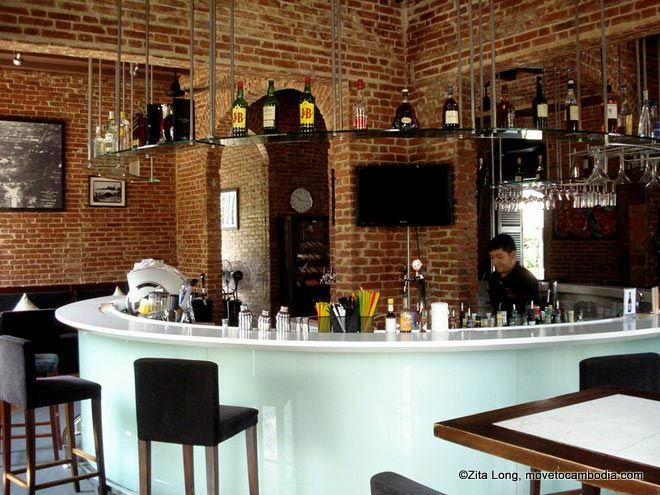 Each component contributes to the restaurant’s refined ambiance. More than that, I love the stark contrast of the manager with a baby strapped to his chest, overlooking the restaurant from the bar, and the servers with untucked dress shirts and baggy blue jeans. Hey, only in Cambodia! The Deco lamb burger, served with feta, arugula, and harissa-ketchup. 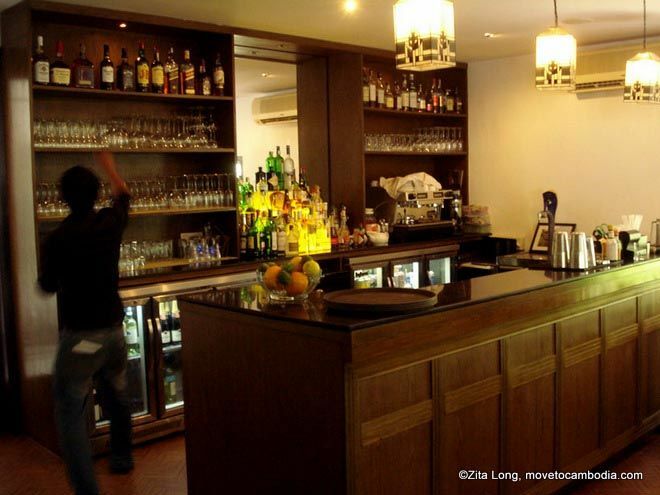 Judging by how often the servers hustled back and forth from the kitchen and dining area, I’d say Deco is a popular lunch destination for Phnom Penh expats. Glancing around, I saw a mix of people adhering to a semi-formal dress code, apart from the manager, servers, and myself. The classy French folks, a group of gossiping women, men in suits, and a lone woman in a black dress, eyes glued to her iPhone. With only seven items listed on their mains, my eyes locked on the lamb burger: crispy, pan-seared lamb, chorizo (Spanish pork sausage), feta cheese, raw onions, and arugula (rocket), between a sesame seed bun. Additionally, served with harissa-ketchup (hot chili pepper paste, with ketchup), remoulade (French mayo-based sauce), and cumin dusted triple-cooked chips. The fresh, herbaceous toppings counterbalanced the distinct taste of savoury lamb, spicy chorizo, and salty feta. In a few words, that’s how I’d describe the overall flavour of the burger. Despite the fact that the restaurant was understaffed and exceeded its capacity (some walk-ins were forced to wait and sit in the lounge area), the servers did a top job tending to each customer. Friendly, too. So my suggestion: book in advance, indoors if you enjoy “Art Deco” and air con. 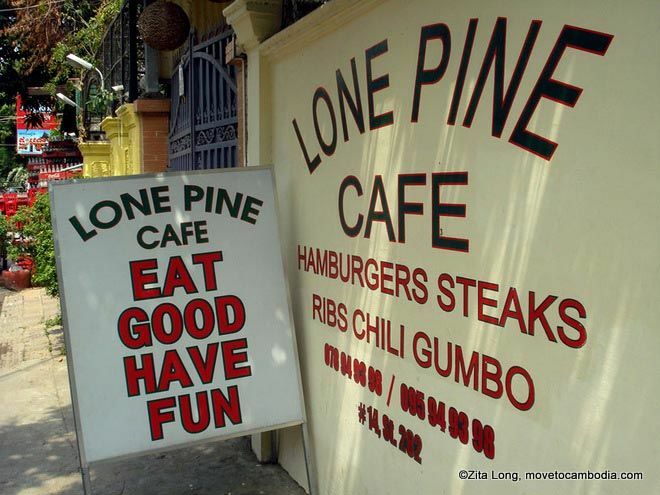 Opposite to my experience at Deco, dining at the Lone Pine Cafe was a fun, casual, American affair. Upon entry, I was greeted by Mr. Will, the owner and manager of the Lone Pine. We talked about the origins of his cafe, his clientele (mostly American expats, with a mix of Europeans, Aussies, and locals), his former burger cafe in New York, and southern American food ranging from gumbo to ribs, steaks, and burgers. My pet peeves of the meal, however, were the fries and ketchup. The quality just wasn’t on par with the burger. On the upside, the servers, including Mr. Will, were attentive and cheery. Without asking, they filled my glass with water to the brim, time after time, seeing how I needed it. Whoever says burgers can’t be classy or playful are partypoopers. 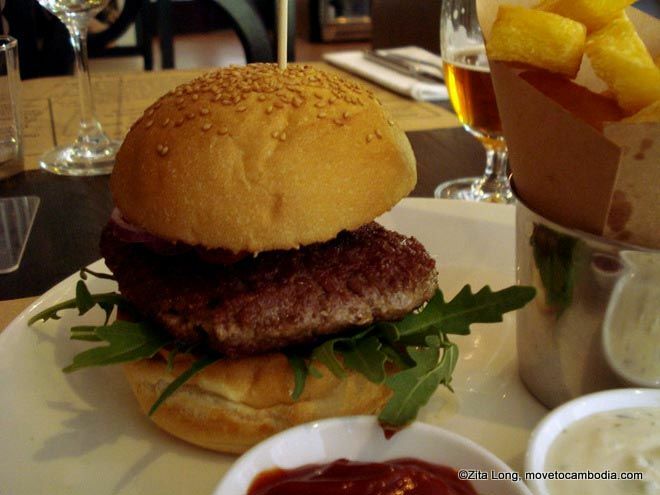 As seen in this post, burgers can be well executed, with solemnity and creativity. People with negative perceptions of burgers are entitled to their opinions, but we must remember: lobsters, salami, goulash, and brown bread were once considered food for the poor. They’ve evolved, making their way into higher class restaurants. So why can’t burgers? My philosophy: welcome all (ethical) foods, whether you hate it or love it, and let cooks, chefs, and bakers push it over their limits, thus enriching the world with newer, possibly greater gastronomic experiences. Strictly keeping to traditions has its merits, but, think about it…where would we be today if we couldn’t adapt and create? P.S. Feel free to post or message recommendations on the “best” burgers in PP. I know I missed out on several. Open Tuesday to Sunday, 11 a.m. to 10 p.m.
Open for lunch Tuesday through Saturday, 12 p.m. til 2 p.m., and for dinner Monday through Saturday, 5:30 p.m. til 10 p.m.
Open Monday through Saturday for lunch, 11:30 a.m. to 2 p.m. and daily for dinner, 6 p.m. to 10 p.m. This entry was posted in Phnom Penh, Food and tagged Deco, The Exchange, Brooklyn Pizza, Lone Pine Cafe. Bookmark the permalink. 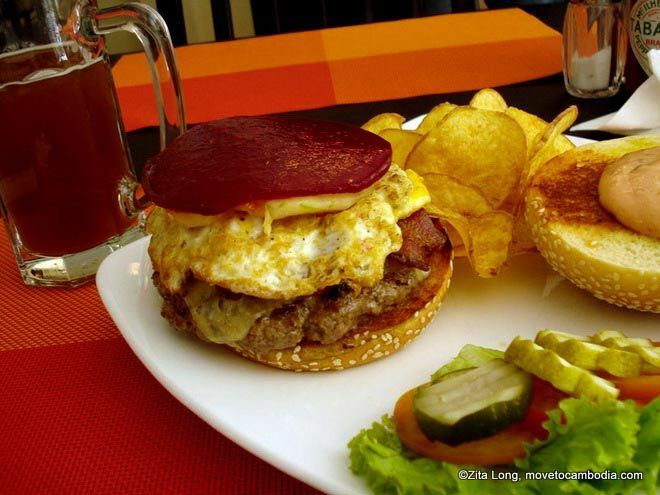 5 Responses to The best burger in Phnom Penh? By far the best burgers in pp are from the blue kiwi on st 13, he doesn’t advertise his food but you have to try the kiwi burger….. Huge and delicious . I have tast few burgers in Phnom Penh. Burger king should be on the list because in just arrive Cambodia and taste and price is acceptable. How anyone in Cambodia can justify charging 9.00 for a burger is beyond me. We have ruined this country and dont say the people are better for it because of hoe expensive you have made it far less people go there and I doubt many cambodiand can go to a place and pay 9.00 for a burger. Burgers look good though.